Thursday has called up four uncapped players in the 15-member squad for the two-match Test series against visiting Zimbabwe. The four players are: Ariful Haque, Mohammad Mithun, Khaled Ahmed and Nazmul Islam. Kamrul Islam, Rubel Hossain and Nurul Hasan have been left out while Tamim Iqbal and Shakib Al Hasan are still injured. Mahmudullah will lead the side in Shakib's absence, because of a finger injury. Tamim, meanwhile, is recovering from a wrist injury sustained at the Asia Cup in September. Kamrul and Rubel picked up just one wicket between them on the two-Test tour of West Indies in June-July, and have lost their places to Mustafizur Rahman and Khaled, the 26-year old right-arm fast bowler who has 48 wickets in 20 first-class matches. Nurul, meanwhile, has been left out of despite being one of just two Bangladeshi batsmen on tour to make a half-century in the Test series. That means Mushfiqur Rahim will keep wickets. Ariful, who has only played T20Is for Bangladesh, has been picked on the back of a strong domestic showing. Earlier this month, he struck 231 for Rangpur against Rajshahi in a first-class fixture. Mithun, meanwhile, has been picked on the back of his limited-overs form. 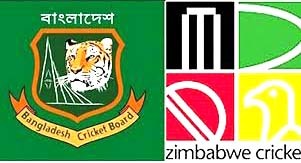 The first Test starts in Sylhet on November 3 while the second and final Test is scheduled to be held from November 11-15 at Sher-e-Bangla National Cricket Stadium at Mirpur. Mahmudullah (captain), Imrul Kayes, Liton Kumar Das, Mominul Haque, NazmulHossain Shanto, Mushfiqur Rahim, Ariful Haque, Mehidy Hasan Miraz, Taijul Islam, Abu Jayed, Shafiul Islam, Mustafizur Rahman, Md Mithun, Khaled Ahmed and Nazmul Islam Apu.